Fine-balancing is then the Job of the balancing team. The leIG18 will become more useful and will fill the roles OKW is lacking. More or less I see the Option to use 1*Püppchen with 1-2*leIG18 instead. Also leIG18 is in medic-truck, so this tech also allows a light AT-Option beside of T2. And first we have to fix what we have ingame. leIG18 is the most misrepresented unit ingame with most potential. -> better remove the fire-Shell-ability of fire-commander and buff the leIG18 as a hole unit. Look at my alternative trench in my mod. I made it to replace the Ostheer trenches. Test them befor you judge. Like in the video, even a T70 can handle them. The AI shells still are the old ones, bad AOE, bad damage. And in direct fire mode they get massive accuracy nerf for the reload buff. I don't get access to the code of Patch-Version of the game, because you don't make it public... don't judge me. Püppchen still is needed to handle tanks. My models are mainly for showing the possibilities of mod-tool. In my opinion only that thing has more priority than the new OKW commander nobody needs... but how I am to say that? LeiG had a little direct fire role back in ww2, but it had small calliber and low velocity rounds, therefore as an ATG its damage shouldnt be better than raketen. In fact, it had hollow-chragers for fighting vehicles, up to 100mm pen. My Version has 50 range, 120 pen and 100 damage. EDIT: I released a new version. - new ability added, low angle shots. (like Zis3 ability, but worse. has cool-down with normal barrage) Ability can be used while in AT-modus. Supply Drop... I would like to see hull-down instead. Would fit better with Osttruppen. Also a Beute-T34 would be great as call-in instead of Supply Drop. It can, but isnt full functional. But you can use it to make some stationary models and fill the opend vehicle with some stuff. E.g. with wire, to simulate a communication vehicle. It is like Alliis have to fight Elefant-Commander which could call in Penals with PTRS and satchels. 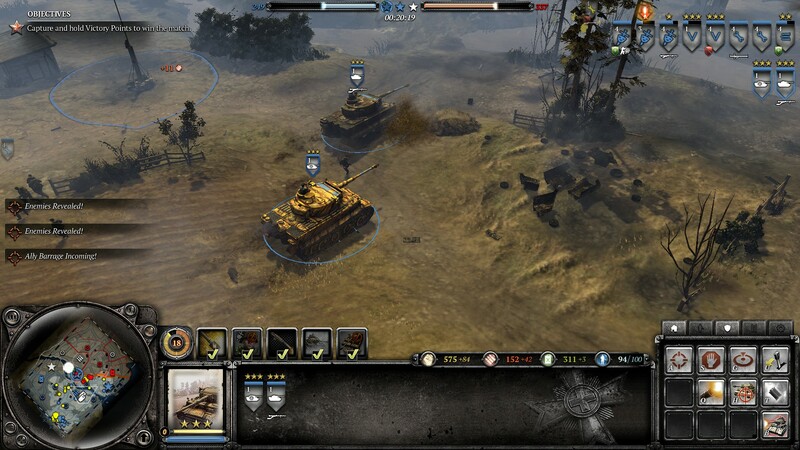 -Tiger Ace named Command Tiger and reworked to be a Normal Tiger with bonus buffs to surrounding units. Now two faction actually got new units. I also agree! For me the only solution to remove this confusing line-up and collision of blue-prints. -> Ost's normal Tiger get some buffs (more like new Ace). Ace will be replaced by King. OKW's command-Tiger gets the tank-commander on the turret and some extras. So we can also recognize these models. Ost's Version has a turret MG and max. Vet3. OKW's Version has a tank-commander and max. Vet5 and a individual skin. This picture is also a good example of how ridiculously out of place the skin looks. But, I really think there is no need for normal Tiger anymore. Replace all Ost's Tigers with the MG-Version and new stats. And OKW gets the commander on the turret and 5-Vet + extra blue-print. So they all get their individual design. Yeah, I mean it's not like people are willing to blob expensive PGrens so they can OHK allied mediums right? Good for you, easy to counter. Micro and outrange them.